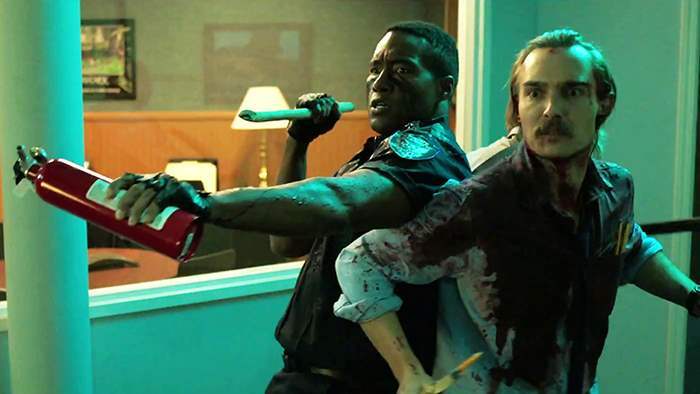 Who doesn’t enjoy an action-packed horror comedy with vampire, blood, gore and slackers? Bloodsucking Bastards is a brand new horror comedy taking place in a office building. The film focuses on two best friends Evan and Tim who work in at a cooperate sales company. Evan is having a super bad day. The night before his girlfriend said “I love you” to him, which sounds insanely romantic, right? Wrong. Evan panicked in the heat of the moment and was unable to verbalize his affection. Instead, he managed to drag out the word “Noooooo.” Ever since then Amanda has been giving him the evil eye! Evan’s boss Ted makes matters worse by not giving him a promotion to Sales Manager. Instead Ted brings on a new, sleazeball named Max. Evan and Max have a bad history that goes back to college, where Max stole Evan’s girlfriend. Meanwhile, Tim, a complete slacker, is doing everything he possibly can to avoid working while on the clock. He’s making jokes with his other co-workers who aren’t working and playing video games while on the phone with customers. Upon Max’s arrival people start to act incredibly strange. Evan and Tim eventually come to suspect that people around them are vampires. From then on, Evan, Tim and the company’s security guard Frank (who really joys Red Bull) band together to kill these bloodsucking bastards and to rescue Evan’s ex-girlfriend Amanda. Bloodsucking Bastards is a mix between Office Space and Shaun of the Dead…just swap out the zombies for vampires. It wasn’t as epic as either of those films. However, it did have plenty of laughs and lots of gore. The cast does an amazing job and has great chemistry. The characters Evan and Tim are complete opposites but balance each other out perfectly. My favorite characters were Tim and Frank. With Tim I loved his energy as well as dialogue! “Bam, snap!” With Frank, although his role is small, every time he popped up on screen I couldn’t stop laughing. Overall, I highly recommend Bloodsucking Bastards because it’s a horror comedy that delivers fun and entertainment. If you enjoy a lot of blood topped with humor, this film is definitely for you.